Row 2-18: Half double crochet in same stitch as turning chain and each stitch across. (14 stitches) 5 stitches unworked. (9 stitches) 4 stitches unworked. 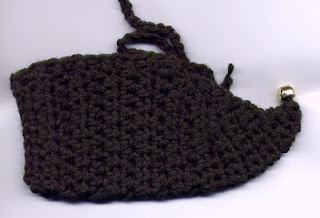 single crochet last 2 stitches together, turn. Row 28: Single crochet in each stitch, chain 1, turn. Row 29: Single crochet 2 together, twice, chain 1, turn. Row 30: Single crochet 2 stitches, chain 1, turn.